This week’s produce boxes will have the choice of two bunches of greens(kale, swiss chard and/or collards), beets, two pounds of squash & zucchini, and the last of the season’s broccoli. $20, paid upon pick-up. Herb (dill, oregano, basil, parsley, chives, garlic chives, spearmint, or chocolate mint) and green onion add-ons are $2 each. 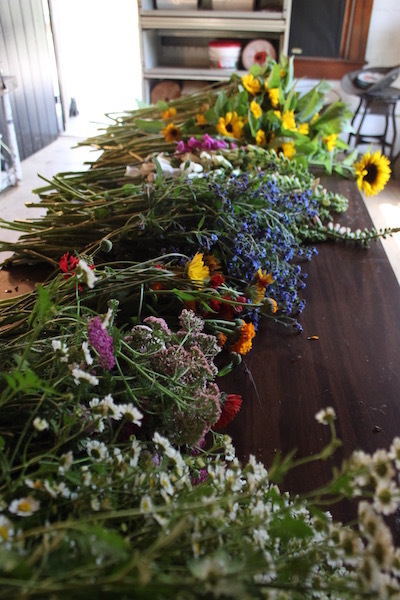 Mixed flower bouquets are available for reservation in three sizes: $8, $12, and $20. They come in a recycled honey jar. Sunflowers are also available for pre-order – four stems for $5 (see photo below). And our farm’s pure, raw honey is available daily at the hardware store. EAT & ENJOY your fresh, organically grown veggies!! 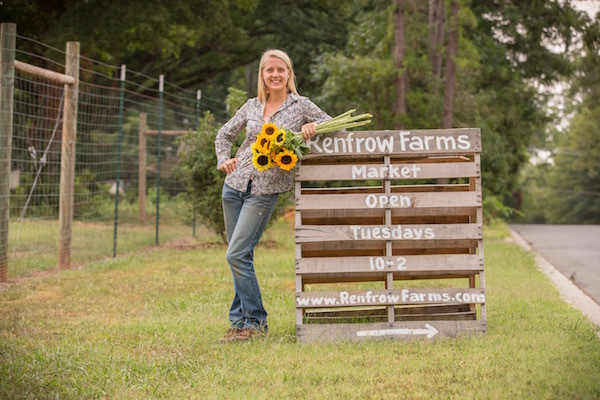 Additionally, I’ll have individual bunches of kale, collards, swiss chard, beets, green onions, squash, zucchini, broccoli, & flowers available at Renfrow Hardware Wednesday through Saturday this week. Our produce will be set up inside the store near the cash registers and honey shelf every day for the rest of the year! 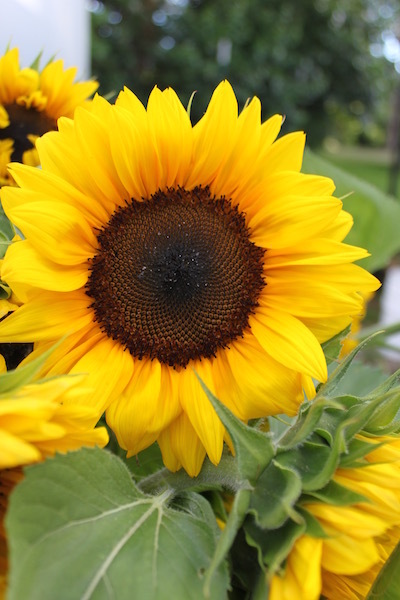 Oodles and oodles of these gorgeous sunflowers burst into bloom this Memorial Day weekend. Pick some up any day this week at Renfrow Hardware. If you want to reserve any for yourself on a certain day, don’t hesitate to shoot me an email. $1.50 per stem or 4 stems for $5. This sunflower, called ProCut Brilliance, is a new variety to me this year, and boy is it a keeper!! 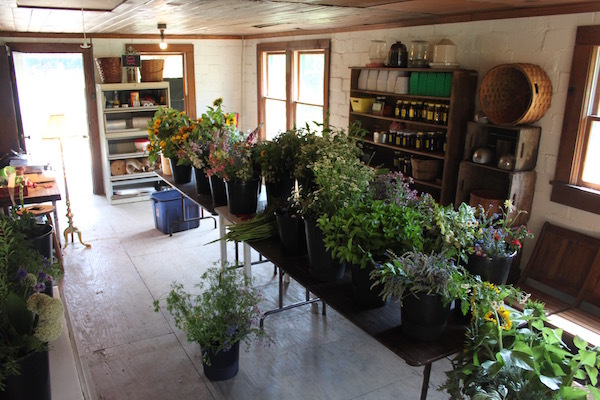 The room that we cleared out in Lilly’s House, which is what we call the little house in the center of the farm where we host our farm stand, served as a wonderful flower prep facility last week when MB and I made a couple dozen flower bouquets for a large wedding rehearsal dinner. 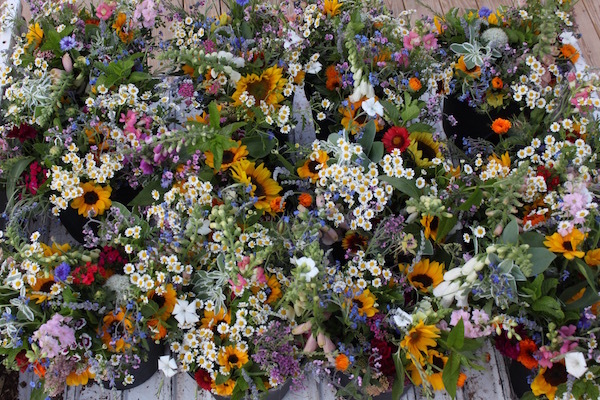 Here is just a small snippet of the blooms that we laid out on the long table before we started assembling the bouquets. 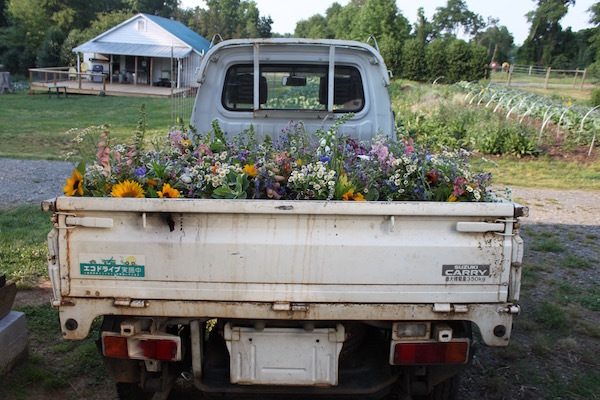 The farm stand is opening for the season starting next week!! Come out to see us on Tuesday, June 7th 10am-2pm and every Tuesday thereafter, through the end of 2016! I’ll be pulling this pallet board sign back out in a couple of days and couldn’t be more excited!